You see, medical device companies offer investors some of the best profit opportunities in the biotech market. "Most medical device companies make their living by staying on the leading edge of innovation, producing some of the coolest gadgets you can imagine," Tremblay said. "And, even better, they can deliver some of the most impressive gains in the bioscience industry to their shareholders." Helping Blind Patients See with the "Bionic Eye"
The biotech company that Tremblay recommends has created the world's first bionic eye, approved by both the U.S. Food and Drug Administration and the European Union. "Some types of blindness are caused by damage to cells in the back of the eye called photoreceptors, which come in two types: cones for perceiving visual color images in bright light, and rods, which are not receptive to color, for seeing in dimmer light and for peripheral vision," Tremblay said. 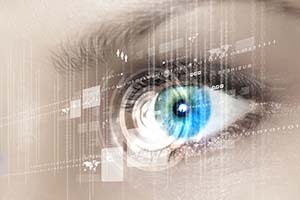 The bionic eye bypasses damaged eye cells via interplay between a miniature camera, a patient-worn visual processing unit (VPU), and an implant in the eye. The camera is housed in the patient's glasses and passes an image to the VPU. The VPU translates it into a set of instructions that are then transmitted, via the camera, to an antenna in the implant. From there, the implant follows the instructions by sending certain electrical impulses to remaining healthy photoreceptors in the eye. They then pass along the message through the optic nerve to be decoded as an image in the brain.